Description: Bronze, Portuguese mariner’s astrolabe coated with silver by Nicolao Ruffo. Item History: The technical evolution of navigational instruments is inherently linked to the historical development of the art and science of navigation. As early seafarers sailed cautiously along familiar coastlines, they developed an intimate knowledge of the daily movements of the sun, moon, and stars. They knew that by determining the height of the polestar (Polaris) above the horizon in their home port they could navigate in the open ocean and return home by sailing north or south until the observed star reached the same elevation. Once the observed star reached the predetermined altitude, returning home was just a matter of turning east or west and sailing in a straight line until home was reached. By the fifteenth century, the latitudes of many coastal cities were common knowledge and movement between these ports was fairly routine. Obviously, the consequence of an increasing number of voyages combined with rudimentary measuring systems was the frequent loss of ships, men, and cargo. As the cost of ships and cargos mounted, the need for more precise navigational techniques became imperative. During the fifteenth and sixteenth centuries, the search for more accurate ways of determining altitude to the development of many new navigational instruments, most of them adaptations of instruments for making astronomical observations ashore. The earliest astronomical instrument converted for nautical use was the quadrant, but the difficulties of keeping the instrument exactly vertical and preventing the plumb bob from blowing offline on the windy, rolling deck of the ship made its use at sea difficult. Like the quadrant, the mariner’s astrolabe was a simplified version of its astronomical counterpart. Stripped of the complex scales and stereographic projections, the mariner’s astrolabe contained only a simple graduated scale and an alidade for measuring the altitude of the sun or for sighting stars. To increase its effectiveness at sea, its weight was increased and its wind resistance was decreased by creating large openings through the body of the instrument. The combined effect of these changes provided greater accuracy than the nautical quadrant and made the mariner’s astrolabe the preferred instrument among navigators for nearly three hundred years beginning around 1460 and continuing through 1700. 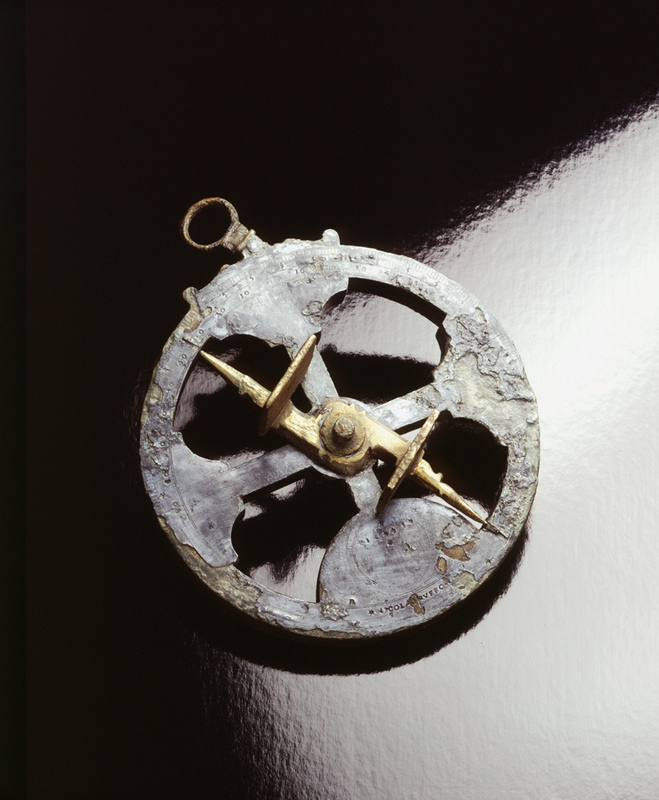 This mariner’s astrolabe was found by diver Gigi Fernandes Corcia from Arqueonautus during the survey and excavation of a 17th century wreck at Passa Pau on the island of Santiago in November of 1999. It was found associated with other mid-seventeenth century material within a complex of deep gullies and caves at a depth of 7 to 12 meters. There was little or no site contamination with extraneous material. It was made by Nicolao Ruffo in 1645 and is currently listed number eighty-four in the National Maritime Museum’s (Greenwich) registry of astrolabes. This particular instrument is unique as the only known example of a mariner’s astrolabe coated with silver. Description:	The instrument has a brass sighting vane attached to the body of the instrument by a threaded bolt, secured by a butterfly bolt on the reverse and a knob and washer on the front. There are three engraved scales: the interior scale is marked 0 to 90° in divisions of 10°, the middle scale is marked in divisions of 5°, and the exterior scale is marked in single degrees. The instrument weights 2.82 kilos. It is 171.45mm in diameter, 21.5mm thick at the top, and 22mm thick at the bottom. ADDITIONAL INFORMATION: See article by B.S. Smith entitled "An astrolabe from Passa Pau, Cape Verde Islands", from The International Journal of Nautical Archaeology, Vol. 31 No. 1, pages 99-107.